So I have an idea on how to bring hero bodyguards back to Battlefront but also make their presence feel meaningful. Certain heroes like the Emperor, Leia, Padme, Obi Wan, etc. could all use unique bodyguards. What if bodyguards were a resource that required battlepoints to be used once the hero spawns on the battlefield? For example, when Obi Wan spawns in, Commander Cody will be purchasable on the menu for slightly more battlepoints than jump troopers or any other special trooper. 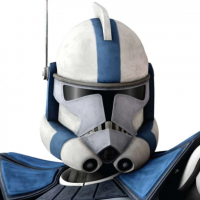 Cody, and other bodyguards, would have between 350-450 health so that he is distinguishably better than the purchasable special troopers but not as tanky as a hero. Through the same reasoning, the Emperor would have his royal guards, Leia and Padme could potentially have guards that coorespond to the map location, Anakin could have Rex, Grevious could have magnaguards, etc. They could have a special trait that encourages playing around their hero such as having cooldown reduction or slightly faster health regen. Giving Vader shadowguards seems to be a little too strong and problematic so I wouldn't go as far as giving him bodyguards. Same could be said for Kylo, though giving him flametroopers as bodyguards would be cool! So what do you guys think? Feel free to add to my thoughts or explain a different system that y'all may have in mind. Thanks for reading. Although I'd rather have Cody and Rex as their own heroes (a discussion for another time), this seems like a good system. I must say though, the Flametroopers should probably be a special unit not tied to Kylo. I think this is what will happen. I like it. But like said before, I would want Rex and Cody to be their own heros. Also the flame trooper might be a reinforcement character like the jet trooper. Sounds good. As long as they spawn on the hero. Vader and two 501st Captains. Guards can be powered down or up to match their heroes and balance things out.